We are at war in Iraq and Afghanistan but the Senate Republicans have spent the summer pandering to their base by debating the estate tax, gay marriage and flag burning. The sole debate we've had on Iraq was notable for Republicans once again offering absolutely no strategy going forward and trotting out the same tired "cut and run" charges against Democrats. Time and again, Republicans have shamelessly put narrow political considerations ahead of policy. Because of the Republican's lack of leadership, the 109th U.S. Senate has not delivered a sound energy policy, a livable minimum wage or any solution for dealing with 46 million Americans without health insurance. [W]e are just over 100 days out from the congressional midterm elections, and an opportunity to ensure that the 110th Senate acts on issues that really matter. That will not happen unless we wake up on November 8th with a Democratic majority in the Senate. We need your help to get serious leaders in control of Congress. 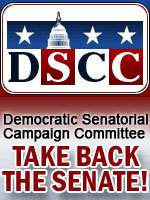 To mark the beginning of our 100 Days Out campaign, the DSCC has set a goal to raise one million dollars by Labor Day. To help kick off our campaign, a group of Democratic senators will triple all donations made before July 31. These final 100 days will make or break the Democratic candidates who are trying to bring back accountability to Washington. That is why your help is so vital today. Please make an immediate contribution. Click here to make a secure online contribution of $50, $75 or more today. You would think that with the Middle East descending into chaos, Republicans would put politics aside and find a way for America to lead the world from the brink of crisis. These guys simply do not have a foreign policy. Four years ago, George Bush swaggered onto the world stage and branded Iraq, Iran and North Korea as the "Axis of Evil." But now we know that Bush had no plans to effectively deal with any of those threats, and as a result each country is more dangerous to America in 2006 than it was in 2002. If we had strong Senate leadership, George W. Bush would have been called to account for these failures. They would have demanded that he explain the incompetence that has Iraq on the verge of trading a dictator for chaos. They would demand to know why almost five years after 9/11 our ports and chemical plants are still unsecured. Instead Republican senators hide behind the flag and make excuses for George Bush because they know their political future is tied to his poll numbers. Devoid of any positive agenda, Republicans will spend the next 100 days trotting out scurrilous attacks on our candidates. Your support will give us the resources to respond. If you make a contribution before July 31, a Democratic Senator will match you 2 to 1, effectively tripling your donation.